Cal Poly Hockey had a successful weekend in Santa Barbara, as Division I gave UC Santa Barbara their first regulation loss of the season with a 5-3 win. Jack Pavek and Danny Kumata lead the Mustangs to buck the Gauchos with two goals each. DI also took down West Valley Junior College 3-1, off of a two goal game from Joe Blakewell. Goalie Mitchell Myjack turned away 35 of the 39 shots he faced during the two-game weekend, which has solidified the Mustang’s third place position in Division I. Division III Gold defeated the Gauchos 8-6. With 4 goals against the Gauchos, Ross Asher had a 14 point weekend. Their single loss of their five game weekend was against West Valley Junior College. Division III Green’s only win was to Cal Poly Pomona. Vincent Leuzze had 4 goals and 3 assists against the Broncos. Next, the Division I Mustangs will play in Huntington Beach on the weekend of Saturday, February 18th. Both DIII squads will enjoy a break before regionals in early March. Cal Poly Hockey came out strong in the NCRHA season opener in San Jose. First playing Arizona State, the D1 team beat the Sun Devils 3-2. Goals came from Alex Waddel, Jake Stom, and Daniel Kumata. Goalie Mitchell Myjack had an impressive 94% save percentage. Next up was against West Valley Community College. They were soundly defeated 7-2. Let's just say last year was a rebuilding year. After a disappointing 15'-16' season with a 4-15 record, we were looking for a better year. With some solid new additions to the team, the Division 1 squad got just that. Losing 3 seniors from last year ( Sam Poyer, Zach Plum, Jake Kockrow), Cal Poly needed fresh blood to rejuvenate the club. This came in the form of 4 freshmen ( Joe Blakewell, John Leone, Jack Pavek, and Matt Akins) and 2 transfer students ( Chris Audi and Mitchell Myjack as goalie). All fought hard to earn their spot on the D1 squad. Returning players from last year include: Alex Waddel, Andrew Klatt, Danny Kumata, Jake Stom, and Matt Fisher. These 11 players look to give Cal Poly a new start for this upcoming season. It’s looking like another strong year for Cal Poly, who is returning 7 Division I players from last year. The veteran team has age and experience on their side this season with six seniors, 2 juniors, a sophomore, and a freshman. Goaltender Nicki Reiff returns for another year between the pipes for Cal Poly. Also among the returners are 3 of the top 5 regular season point leaders from last year: seniors Sam Poyer, Ryan Newens and Chris Kumata. The trio amassed a total of 140 points in 16 regular season games and will look to improve upon that number for this year. Sniper Matt Fisher returns on offense for his second year, and looks to join the top scorers on the squad. Also returning are the tight knit defensive duo of Nico Delkeskamp and Jake Kockrow for their third year of Division I play. Mitch Plum also returns on Defense and is joined by his brother, Zach Plum. The newest face to the organization is the freshman offensive threat, Alex "Fishbowl" Waddel. Prior to Cal Poly, Waddel captained the Jr. Steelheads 18U team in Idaho and he looks forward to making an impact offensively. Looking forward to the San Jose kickoff tournament, Cal Poly faces Arizona State, UNLV and San Jose State. After a couple great days of tryouts, we have our teams mostly finalized. The players listed under tryout basis will have the opportunity to showcase their skill during the first couple weeks of practice before our first tournament before our coach makes the final decision. Two players and one goalie will play for D1 and the remaining two players and one goalie will play for B-Gold. 2011: Mustangs D1-Team Finishes 2nd in the Nation After An Amazing Run! It started with pool play and we lost our first game to Eastern Michigan in a nail bitter 7 to 6. We were winning the whole game until they came back in the end of the third period. We didn't lose another game until the national championship. I think this game really fired us up because everyone knew we should have won. We won our next two pool games against Metro State-Denver and Brockport from New York. We recorded the only shut out of the whole tournament against Brockport with a score of 5 to 0. Our Goalie Erik Long was excellent in that game, Then the Metro State game was 5 to 2. Our first round playoff game was against North Texas, a team we knew we couldn't take lightly becuase they had played number 1 seed Lindenwood twice this year and only lost by a couple of goals each time. We beat them 6 to 2 in a game that that got us to the second round. At this point we were expected to be where we were, we went in as the 19th seed out of 24 teams and we knew we could win at least our first playoff game. The next round against our all time rival Arizona State was the game of the tournament for us though, They were seeded number 2 in the nation and they are of course from our region, the WCRHL, so we had played them 5 times over the course of the season. We had only beat them once during the seaosn but every time we played them it was always only a goal or two difference in the end, We knew we could play with them and we had nothing to lose, they were the ones with all the pressure on them because they were expected to win. We came harder than we ever had before in the season and everyone on the whole team wanted it so badly. We had a bad history with ASU so it was an intense, gritty game. One of our three freshman, Alex Karic, scored the game winning goal for his only goal of the tourny...He grew up in Arizona playing with alot of those guys so it was extra special for him. The deciding factor for this game though was our defense and our goaltending. Erik Long played amazing in net and our four defenseman Kevin Middlekauff, Michael Chaloupka, Jack Hotho and Chris Kumata all stepped up and played amazing, especially because ASU is such an offensive team. We won that 2 to 1 in a game that got the whole tournament talking. Everyone said it was an upset but I didn't think so, we skated well with them all year and it just came down to us wanting it way more than them. We moved onto the sweet 16 in which we met a really good Missouri State team. Our leading scorer for the season, also a freshman, Ryan Newens was in a bit of a slump in the beginning of the tournament but he finally stepped it up when we needed him to. He scored 4 goals in a 6 to 2 win over Missouri State. At this point we were just rollin and everyone was having a blast, I think we were just all so stoked to get past ASU that there was no more pressure and we were just having fun playing our game. We then went to the semi-finals against Rowan University, who was ranked number 3 in the country. We had another difficult task but once again we rose to the occasion. Our leading scoring defenseman Kevin Middlekauff, who was having the tournament of his life, scored 4 goals and Erik Long had another unbelievable game...we flew by em 7 to 2. We had made it the national championship game and it was sort of bitter sweet for us because we knew we were playing fellow WCRHL memeber Long Beach State. We had been cheering them on the whole tournament and they had been cheering us on. Their Captain Ryan Burrows is a really great guy and a good friend to all of us, he came in to our locker room after every game and gave us a little cheer, so we knew it be tough for one of us had to lose. Cal Poly has only beat Long Beach once in the history of us playing and that was this year in a won goal win. They are by far the deepest team in the nation, every single one of those guys is an unbelievable player and they definitely deserved to win that national championship. We only lost by one goal, 4 to 3. But in the end not one of us hung our heads, we got second in the nation and no on expected us to. I think it all came down to how much fun we were having. We are all such good friends off the rink that we know how to handle each other on the rink. After the ASU game we were just all smiles. I think it made a difference that every team we played completley under estimated us too. Every single one of our guys is a scoring threat, and it showed with all 8 guys scoring in the tournament, and a different star each game. It was one hell of a run and with only a few of us not returning next year you can expect us to make another run at the cup. D1-team and B-Gold Team Headed to Nationals in Madison, Wisconsin! 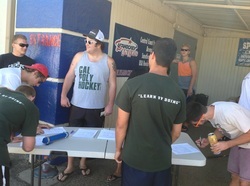 After a long season for all three teams of the Cal Poly Hockey Club, two of them will get the chance to compete in the National Collegiate Roller Hockey Association National Championship Tournament in Madison, Wisconsin. The Division 1 Mustangs will start pool play on Wednesday April 6th while the B-Gold Team will start on April 7th. For the Division 1 team, they will play three round robin games with the teams in their pool, then after the reseeding they will start bracket play. The teams in their pool are Eastern Michigan University, Metro State-Denver, and Brockport University, all of which the Mustangs have never faced-off against. They go in as the number 19 seed in the nation out of 43 division 1 teams. The division 1 team ended the regular season with a much impressive 12-6-2 record, and a 4th place finish at the Western Collegiate Roller Hockey League Regional Championships. The Division 1 championship game is on Saturday april 9th at 7:30 pm. Then B-Gold Team will also start with 3 pool games then move to bracket play. They will face-off against North Texas, Metro State-Denver, and Suffolk Community College. They go in as the number 16 seed out of 53 B division teams. The B-Gold Team ended their season on top of the central conference and tied for second in the b Division with a 13-3 record. They also finished 4th at the Western Collegiate Roller Hockey League Regional Championships. Then B Division Championship game will be held on April 10th at 1:30 pm. Follow all the games with Live Box Scores and Updates with this link: Click Here Go Mustangs! Cal Poly Television did a story on the Cal Poly Hockey Team on November 12th, 2010. Click Here to view.